Programmable Hydraulic Paper Cutting Machine that we offer features guide system for back gauge accuracy. It Comes with Air Cushion Table for easy handling of paper bundles. 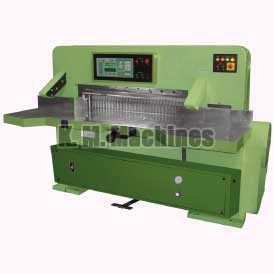 We manufacture Programmable Hydraulic Paper Cutting Machine keeping in mind the comfort of the operator. It is equipped with infra red safety device, cutting line indicator, motorized back gauge and magnetic clutch & brake. We make available Programmable Hydraulic Paper Cutting Machine with different types of accessories such as Two Spanners, One Screw Driver, L Keys, Oil Can and one extra Cutting Knife.